‘Tis the season to get ugly. 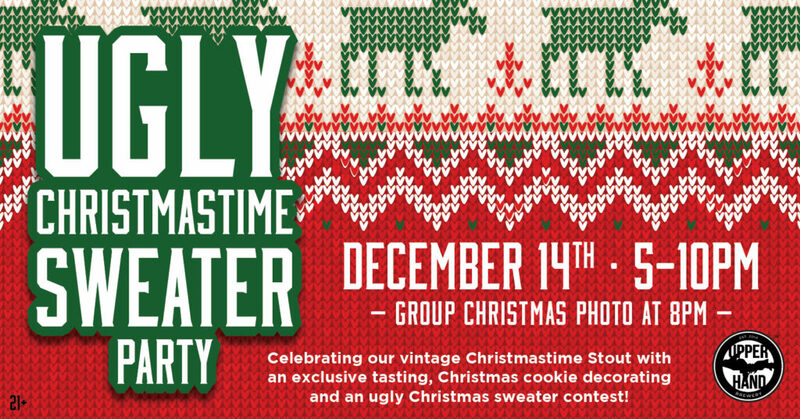 Don your craziest, ugliest, glitteriest, festivest, wildest sweaters & outfits for our Ugly Christmastime Sweater Party taking place from 5-10 p.m., Dec. 14, at our Taproom. We’ll be tapping a special reserve of vintage Christmastime Stout. There will also be Christmas cookies to decorate and a contest for best/ugliest sweaters. Get here by 8 p.m. to be part of the Group Photo! This event is free and open to the public. Must be at least 21 years old to attend.